With all that’s happened at the World Championships in the last two days, writing about the women’s 10,000 is like writing about ancient history. It was so long ago — do you remember? It was the race when three American women finished third, fourth, and sixth, a team performance that was better than Kenya and better than Ethiopia. Remember how Molly Huddle had the bronze medal in sight, but let up a few meters before the line and was passed by Emily Infeld? We all cringed when that happened, knowing that it would instantly join other video exhibits of why you should always run through the line. But we don’t, you know. What on earth was he talking about, I wondered, and then I remembered that two weeks earlier I had been supervising the workout of an ex-student of mine, and took him aside after his first interval and told him he needed to run hard through the line on every interval, even in practice. Well, duh, that’s what all coaches do. We all say it all the time, and yet, endless repetition doesn’t change the fact that the habit is hard to break. Or maybe it does. Apparently, after the U.S. Championships Shalane Flanagan took Emily Infeld aside and told her that the only reason she (Flanagan) had beaten her (Infeld), was that Infeld had let up at the end. “You’re faster than me,” Flanagan said. 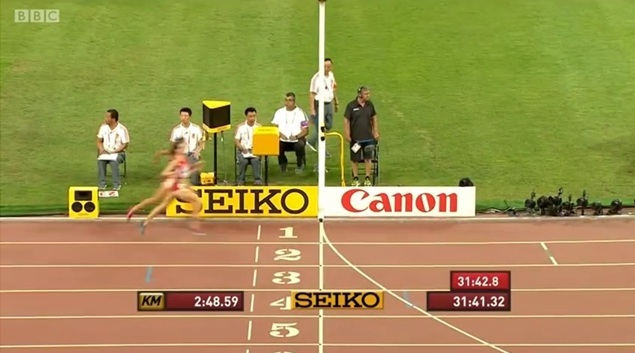 Maybe Flanagans’s coaching made all the difference in the final meters of the WC final. Most of us who run races, whether at the World Championships or in local fun runs, are prone to anticipate the finish line by slackening our effort. Since Huddle’s self-inflicted misfortune, there have been plenty of examples in Beijing of runners not running through the line. Most conspicuously, Genzebe Dibaba took plenty of time (relatively speaking) to celebrate before crossing the line in the women’s 1500. I think it’s deeply ingrained in our nature to save ourselves the extra, often unneeded discomfort of continuing to sprint when we have been running quite hard for quite a while. Maybe it’s because if I’m ahead, I want the race to conclude sooner, and in a tragic miscalculation of cause and effect, I instinctively try to bring about the race’s end by acting as though it is already over. It’s tragic because not running prolongs the actual race, even if it seems to shorten the period of my suffering. And if I’m behind, but closing, then I want the race to be prolonged, even though I’m sprinting for all I’m worth to shorten the time before all further efforts will be useless. Or maybe slowing down at the end is an unconscious desire to extend the experience of knowing that it’s almost over. For 99% of a distance race, I think we run with an element of fear for how much the finish will take out of us. I know that I’m never completely certain I’ll even finish a race until very near the end. So when the finish is finally RIGHT THERE in front of you, the relief is often so sweet that you want to hang onto it for a split second. I’m not comparing Huddle’s lapse to Ovett’s epic embarrassment, but it does illustrate that how we remember these incidents depends a lot on what motives we impute to the runner who is caught at the line. Huddle had run a great race up to that point, and I’d like to think that what’s so tough about watching her lose the bronze is our feeling that she deserved it, and was simply careless at the worst possible time. It’s interesting to think about how different that advice sounds when it’s a warning (as it would be when addressed to Huddle) or a rallying cry (as it would be when addressed to Infeld or Treacy). I’d like to think that coaching someone to run through the line isn’t just a way of saying don’t blow it, but is a more positive direction to really honor yourself by embracing every possibility that the race offers you, even if you seem beaten or even if victory seems assured. Every step matters. And if I really did have Molly Huddle’s ear, I’d tell her that life is long, mistakes are inevitable, and you can only worry about moving forward… the race and the ultimate goal are still in front of you, not behind you. This entry was posted in Coaching, Pro Runners and tagged Emily Infeld, Molly Huddle. Bookmark the permalink.